July 29, 2015 is the official release date for the next version of Microsoft’s Windows Operating system, Windows 10. Update notifications on the taskbar have started popping up for users running Windows 7 or 8 (and 8.1) users (if you haven’t received one, just run Windows Update). Once you have clicked the notification (either via the taskbar or the Windows Update pane), you’ll get the reservation window which you see below. 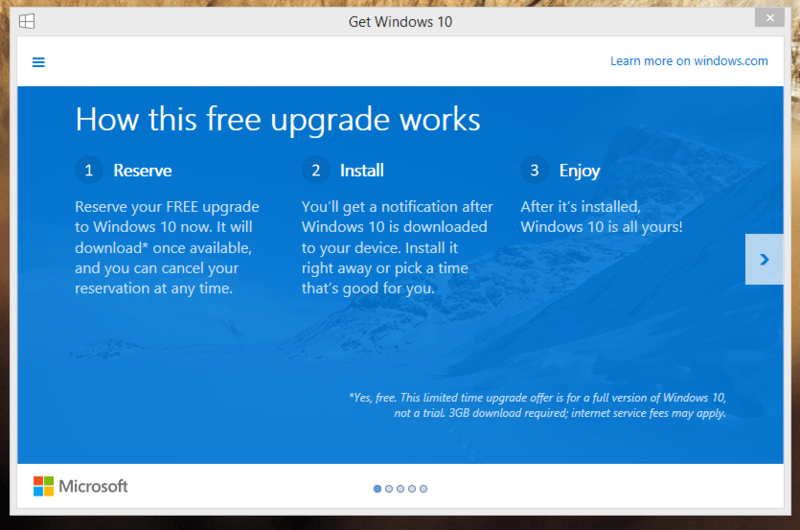 Once you go through the process, Windows 10 will download in the background for you as soon as it becomes available and your computer will ask if you want to install or defer the upgrade at a later time. Windows 10 will be released globally on July 29 and will be a free upgrade to legit users of Windows 7 and Windows 8.1. OEM prices start at $109 for the Home version and $149 for the Pro version.